Unsecured cargo can fall from a vehicle, or be thrown from it, at any time in the load’s journey. It’s a danger to those who load and unload the vehicle, to pedestrians, to other road users and to the driver as well. An additional danger comes from the effect of insecure cargo on the vehicle’s steering and control. 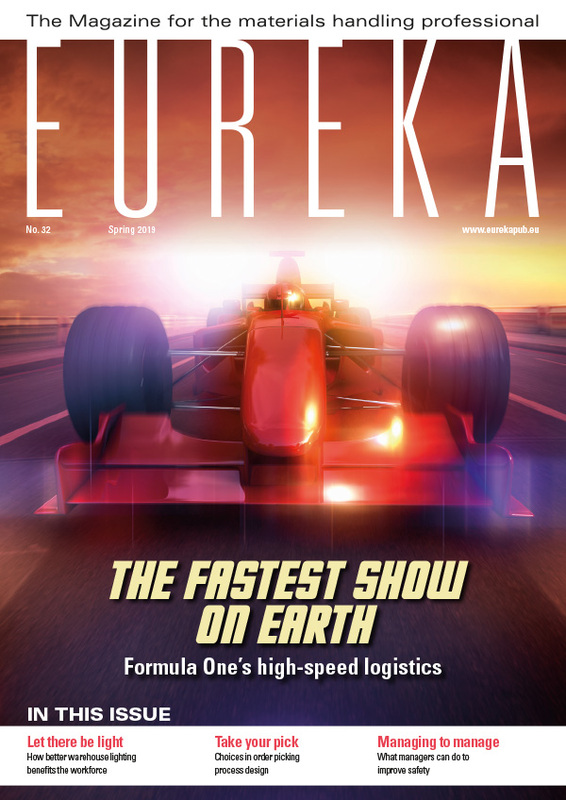 It is a major topic of discussion for the Freight Transport Association (FTA), which has been looking closely at how the load security rules are being enforced in Britain and how businesses can be sure of complying with them. The question of how to comply is not always an easy one to answer precisely, but the consequences of failing to comply can be very serious. Risks include heavy punishment by the law and, in the event of an accident, expensive damage to vehicles, loss of goods and, most tragically, injuries or fatalities. Richard Owens, of commercial vehicle manufacturer Don-Bur, has been advising FTA members on the principles, regulations and methods involved in load security. He continues: “If you place an object on the deck of a vehicle, its own weight will initially hold it in place. But once the vehicle starts to move, the load becomes subject to other forces. If the vehicle travels slowly and smoothly, friction between the object and the deck may initially prevent the load from moving. The problem comes when the vehicle brakes harshly or changes direction suddenly. That’s when the load will want to continue moving in its original direction and will overcome the effect of friction. Load-fix system with wide strap design. Image courtesy of Don-Bur. 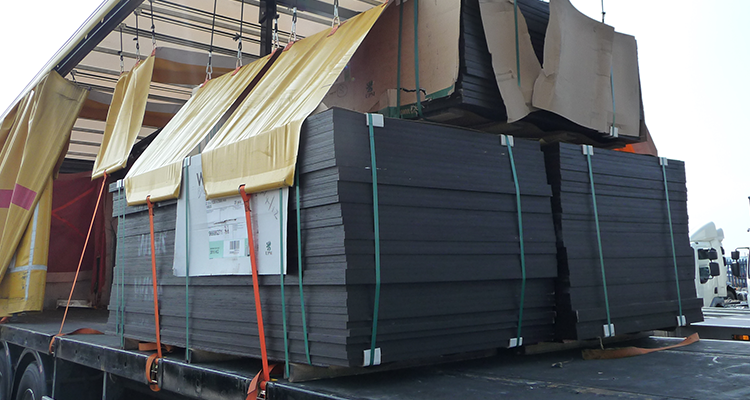 European standard EN 12642-XL gives ratings to commercial vehicles and trailers according to their ability to restrain and contain loads. 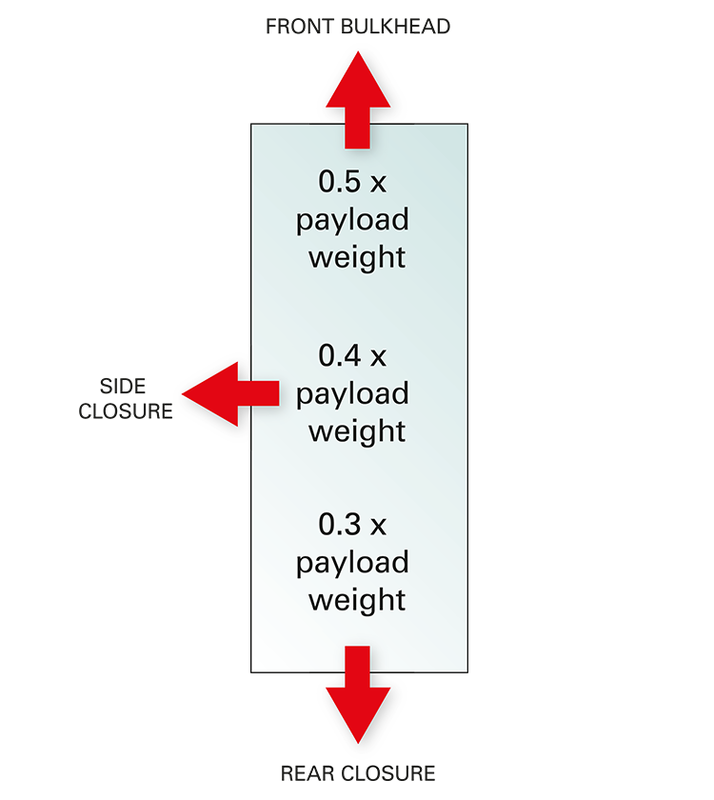 The front wall must be able to withstand a force equivalent to 0.5 x the payload weight. The rear should withstand 0.3 x payload weight and the sides 0.4 x payload weight. This is a slight oversimplification, as EN 12642-XL also takes into account height and vehicle length. In some circumstances, such as road accidents, the force applied by the load may be larger than normal, so these figures should be used as a minimum requirement. Interestingly, operators in the UK must comply with a stricter standard, set in a code of practice used by the Department for Transport (DfT), which insists on: front 1.0 x; rear 0.5 x; side 0.5 x payload weight. But while EN 12642-XL ratings are certified by testing, there is no such certification to prove compliance with the UK rules. The EN 12642-XL rating must be clearly displayed on the vehicle. If the curtains of a curtain-sided vehicle have been designed as part of its system for restraining loads, and if they comply with EN 12642-XL, this should be clearly marked on the vehicle. In all other cases, side curtains should be seen as having only a weather protection function and should not be considered as being part of the restraint solution. It should be noted that for EN 12642-XL rated security to be effective the vehicle must be loaded so that gaps between the cargo and the headboard, rear doors and sides are minimised. Don-Bur Load-fix system applied to kegs. Image courtesy of Carlsberg. There are many different solutions for restraining and containing goods safely, of which just a few examples will be mentioned here. For containment, curtains can play a part if they are appropriately designed and fitted with straps or other security devices. Side nets, side webbing and rigid ‘cabbage’ boards are other options. For restraint, standard curtains are not suitable and purpose-designed straps must be used in preference to ropes. 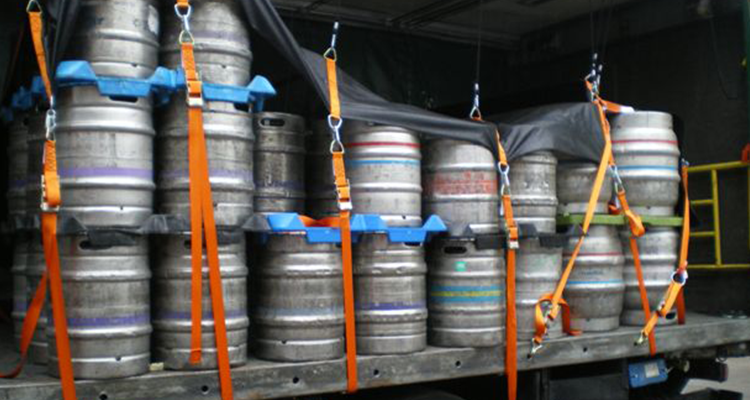 Straps suspended from the roof will not be sufficient, at least on their own, as the vehicle or trailer body will not provide enough strength. 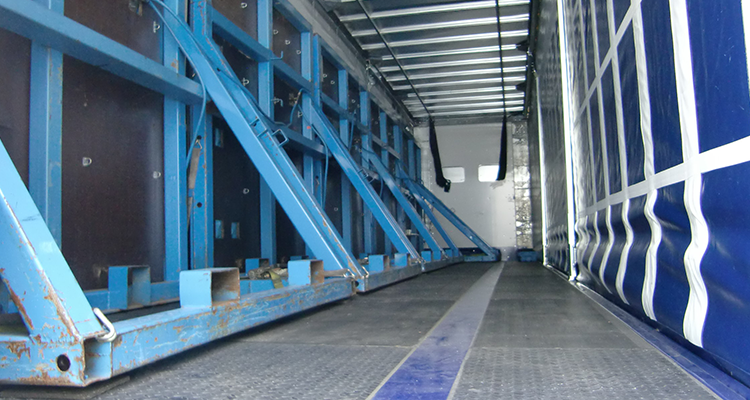 Straps extending over the cargo, from one side of the loading deck to the other, give much greater security as they make use of the much greater strength of the chassis. In the UK this is known as ‘rave-to-rave’ strapping and it is the method recommended by the government’s Health and Safety Laboratory. Other restraining methods include cross strapping; longitudinal and transverse strapping, transverse nets and load restraint tracks. On the Don-Bur website you will also find the ‘Load-fix’ solution, which is a versatile rave-to-rave system. A variety of lashing post designs can be found on vehicles and these are greatly preferable to rope hooks. The FTA has also received advice from Mark Horton of the UK’s Vehicle and Operator Services Agency (VOSA) on the reasoning behind this government agency’s new approach to enforcement. To reduce injuries and fatalities, VOSA is making a big effort to check that companies are complying with the rules on load security. Its strategy has been to divide the possible defects in load securing into categories of seriousness: 1, 2 and 3. The danger posed in each case depends on the type of load, categorised as A, B or C. An Enforcement Matrix is then used to decide whether the combination of defect and load type requires a prohibition action or just an advisory note. The assessment is not quite that simple but this is its basis. Examiners are being trained to apply the rules consistently and to deal effectively with any vehicle whose lack of load security or stability presents an immediate danger of causing harm. 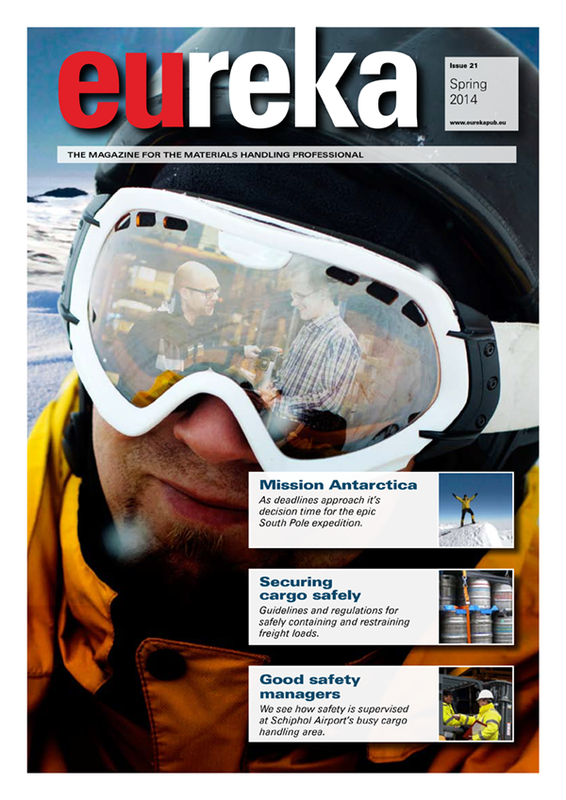 The European Union’s Directorate-General for Energy and Transport has developed best practice guidelines on cargo securing, which give details for many different load types and situations. For the UK, the Department for Transport’s code of practice on safety of loads on vehicles is also very detailed. Specialists such as Don-Bur will be able to give additional advice and interpretation, but it is not always possible for the guidance documents or their interpreters to give a precise guarantee that a particular solution will comply with the rules in a particular situation. As in many cases, the safest approach is to try to do more than the law requires.